Corsair Air Series LED high airflow PC case fans combine efficient, low-noise airflow with striking LED lighting. The custom-molded blades are designed for high-volume air delivery with less noise and turbulence than typical case fans. They?re translucent, with a frosted texture, so the light from the four LEDs adds a dramatic effect. Air Series AF fan models perform best in unrestricted spaces with at least 3cm of clearance, and they?re ideal for mounting at the rear or top of your PC case as exhaust fans for your PC?s motherboard and CPU, graphics accelerators, and other components that fill the case with heat. They work equally well as unrestricted intake fans for areas like side panels or bottom intakes. For high restriction areas like hard drive cages or in other tight spaces where there?s less air volume, check out our Air Series SP models of high static pressure fans. 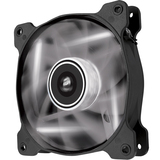 Air Series AF fan models are designed to outperform standard case fans. The blades are custom-molded for optimal airflow, and they?re ultra-thin for less noise and turbulence. The sleeved bearing system reduces vibration for quiet operation.